The Ayurvedic tradition of healing makes use of many common herbs and spices. But the ground spices you buy in the supermarket, even if they are organic, have impaired potency. And they just don’t taste as good as hand-ground spices. In India, many if not most cooks grind their spices by hand using a stone and a roller. Certainly, a traditional Ayurvedic practitioner would not consider using commercially ground spices in medicinal formulas. When spices are ground with home or commerical blade grinders, a lot of heat is generated. The spices have essentially been cooked before you buy them, thus significantly changing their taste and energetic qualities. Spices such as cardamom, cinnamon, coriander, cumin, nutmeg and fennel contain volatile oils. When you grind them with regular blade grinders, the oils are cooked, and then almost immediately, they start becoming rancid. Then they sit around for weeks or months in warehouses and grocery shelves where the rancidity increases and flavor decreases. You don’t have to take my word for it. Buy some ground cardamom from your local grocery story. Then for comparison, grind a bit of cardamom by hand using a mortar and pestle, or a hand crank grinder. Smell one. Then the other. The difference will be dramatic. If you’ve got a reasonably good sniffer, you can even try this test. Grind fresh, whole cardamom seed in a typical home blade machine, such as a small coffee grinder. Then grind the same seeds by hand. The difference will be less dramatic, but still noticable. What is lost in the home or commercial blade grinding process? First, the digestive fire-enkindling or regulating power is muffled by the “cooking process,” rancidity and age. Second, the spices lose a good bit of what I call their bouquet. The floral bouquet of aromatic spices is an expression of space element. It is largely responsible for the more esoteric capacity of the spice to open, or create more expansiveness in the subtle channels, primarily mind and digestive channels. 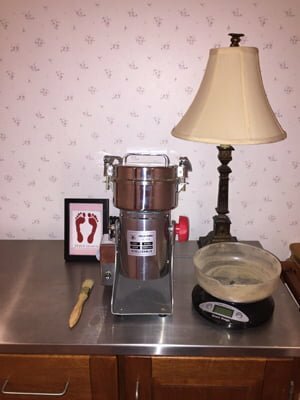 I have been on a ten-year-long mission to learn how to grind spices without destroying them, and without making the effort to grind them by hand. My first attempts were with ceramic burr grinders. These are generally expensive appliances intended to grind coffee beans. Ceramic burr grinders pulverize more slowly than a blade grinder, and so they generate less heat. Although I discovered a couple of burr grinders that could be used with a variety of spices, most simply clogged up and stopped working. And the ones that worked only sort-of worked, requiring much coaxing, de-clogging and re-grinding. The grind produced was never really fine enough, or even-textured. Still, the bouquet was intact, and so I carried on. Recently, I took the plunge and bought a Chinese medicinal herb grinder. These grinders work with a different principle – instead of slowing down the grinding process, they speed it up to such a degree that there is no time for the herbs and spices to “cook.” They are blade grinders, but the blades turn at speeds thousands of times faster than say your little Braun table top coffee grinder. The Chinese grinders are basic pieces of machinery found in traditional pharmacies, and also in medicinal herb factories. Mine cost about $250 including shipping from China. It holds 300gm of material. There are somewhat cheaper varieties and much more expensive models that grind even faster and/or hold more material. For the first time, I have an even, fine grind produced with less heat (although still not quite as low as hand-ground). Cinnamon sticks, nutmeg and cloves? Not a problem. I did incur a small finger cut on the unbeveled inside rim of the lid. This is not a Kitchenaid. In fact, the red knob seems to have no function other than to be a red knob. But today I pulled out my new spice jars, printed up some labels, and spent a couple of hours producing heavenly scents.